A house and garden for the man in the street. 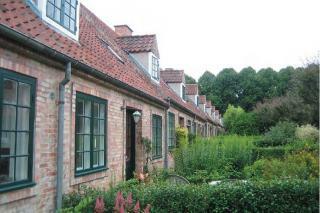 This was the intention behind Bakkehusene" in Bellahøj, the first major project of the KAB cooperative housing society. 171 one-and-a-half-storey homes were built between 1921 and 1923. The architects, Ivar Bentsen and Thorkil Henningsen, were inspired by small provincial town houses with small front gardens and slightly larger back gardens. KAB's Director, F. C. Boldsen, had already visited England in 1909 to study the garden city of Letchworth, inspired by English-born Ebenezer Howard's book Garden Cities of Tomorrow. " Bakkehusene were not necessarily a workman's dream come true. What we now see as an attractive, light and airy central location was viewed with some scepticism at the time. Back in the 1920s, the houses were far out in the countryside, with no trams and just a cinder road. Although the terraced houses were well-planned, they were considered ugly because they resembled barracks, and the general public never took them to heart. Terraced houses were not considered to be quite the homeowner's ideal prescribed by the middle classes. Instead of workers, however, intellectuals moved in. They did not long for detached houses of their own, and appreciated the new type of housing with its unusual urban environment.